There are ways of knowing. There are ways of knowing that bypass, if not the brain, then at least the logical, linear, linguistic parts of the brain. There are ways of knowing things with your hands. 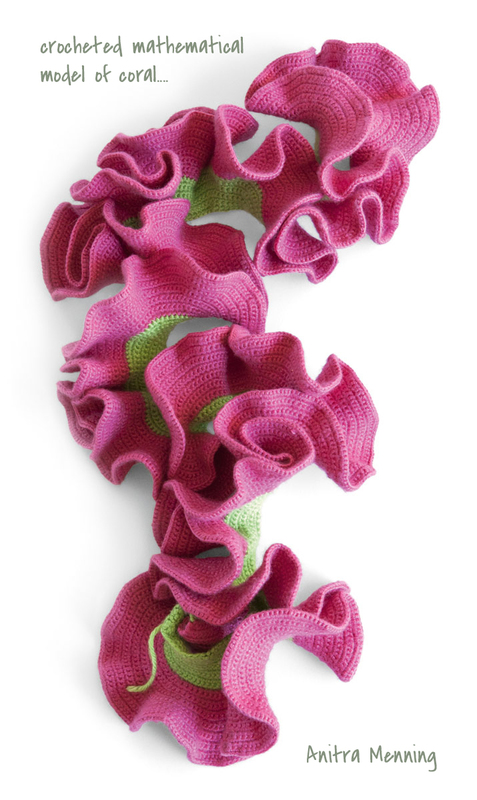 There are ways of demonstrating ideas because you can use them, or do them, or at least make a model of them. 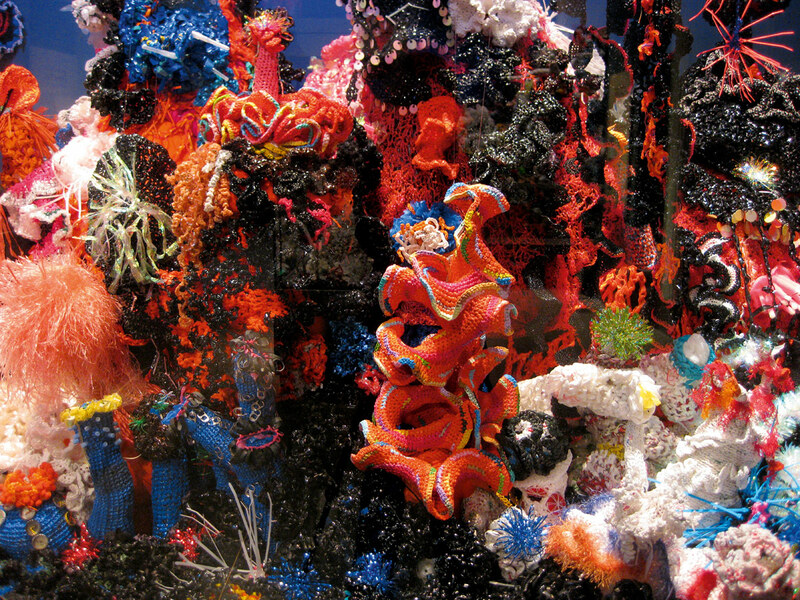 A crocheted mathematical model of a coral reef. There is truth in the things we can make and demonstrate with our hands, even if we can’t reduce it to a formula. There are villagers all over Africa who build their villages in fractal patterns ; not the same fractal pattern, but many different ones across the continent [Ron Eglash, Rensselaer Polytechnic Institute]. I don’t pretend to understand the math or the science of fractals, but I know it refers to a geometry which replicates the same shape at different scales, ad infinitum. Without equations or labels or formulae, Africans have been building communities using fractal geometry for centuries; expressing their social structures and embedding their myths in their architecture. There is a non-hierarchical way of knowing the world which is reflected in how they order their communities. There is even self-organizing (fractal) design in their play. A Mancala board with "stones." What I loved about the game was the way the pebbles felt in my hands. The dropping of them one by one has a tangibility and a logic and a rhythm of its own (one-to-one correspondence). 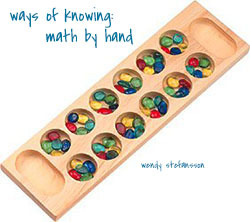 The heft of a handful of pebbles, the gradual diminishment as you repeatedly subtract one from the handful (subtraction as loss, as “less;” division as repeated subtraction), the gradual addition to each well on the board, the estimation or mental math of knowing how many pebbles are in each well as they change throughout the play (subitizing, number sense). It may have been Math but it was a Math I understood with my hands. No equations or formulae. No pencil or paper. Just doing it. Just replicating a pattern or formula or a simple set of rules, over and over again. And it would be like planting seeds. A simple, everyday, organic, radical way of knowing. With our hands.